UNITED NATIONS, April 9, 1:41 pm, updated 6:50 pm -- To commemorate the 13th anniversary of the beginning of the genocide in Rwanda, a photo exhibit was scheduled to open today in the lobby of the UN General Assembly. It has now been cancelled or postponed, due to objections raised by Turkey to a reference in the exhibit to one million Armenians murdered in 1915. While during the UN's noon press briefing spokesman Farhan Haq ascribed the postponement to a failure to have vetted the exhibit, other UN insiders state that the Department of Public Information had signed off on it, but that Turkey's eleventh-hour objection called the previous DPI approval into question. At Monday's noon press briefing, Inner City Press asked about another current exhibition at the UN, in the lobby by the Vienna Cafe, of graphic photographs of ethnic cleansing in Georgia's breakaway region of Abkhazia. Video here. Mr. Haq stated that that exhibit had been reviewed, and that the same scrutiny is given to exhibits in public spaces of the General Assembly and of the Secretariat building. The Abkhaz exhibit coincides with the UN Security Council's consideration on April 10 of the situation in Abkhazia, including allegations of Russian bombing of pro-Georgia positions. In late 2006, there was an exhibit by the Vienna Cafe which, although not cancelled, became the subject to behind-the-scenes controversy, not for its content but for its sponsor. Blue-clad representatives of a Taiwan-based non-governmental organization, the Tzu Chi Foundation, served tea and handed out literature in front of displays concerning the seventh century ramble of XuanZang through Central Asia. At the last minute, the Chinese delegation became aware of the Taiwan connection of the exhibit, and tried to have it cancelled. But Swaziland stepped in as sponsor, and so the exhibition went forward. Inner City Press at the opening asked Swaziland's Ambassador for his nation's position on Taiwan, a question the Ambassador declined to answer. 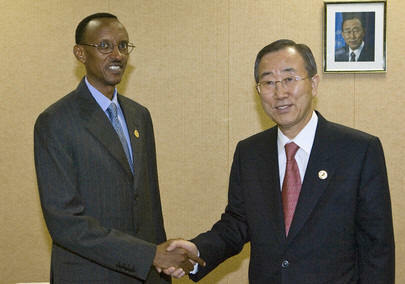 But Swaziland remains one of the countries which recognizes Taiwan, as until last year Chad did. The politics of even exhibitions at the UN continues to amaze. While Ban Ki-moon's Rwanda statement remains online, its final line, that "later today Mr. Ban will give a signed copy of his message to Rwanda�s Permanent Representative to the UN" is now in question, as this was to take place at the opening of the exhibition. 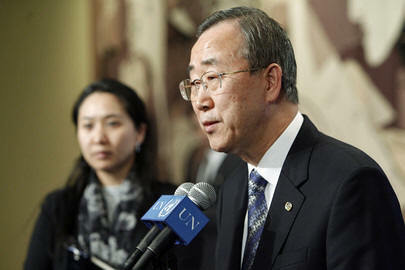 [Update 5:57 pm: With Turkey's role confirmed, Mr. Ban instead read out his statement on the 38th floor, on the UN's closed circuit TV network, and gave the signed copy to Rwanda�s Permanent Representative, who referred to the exhibition "which was supposed to open today but which has been postponed." Down in the lobby, unlike the earlier report, the photos were no longer "turned around" - they had been taken down entirely. Postponed or cancelled? There were black boxes -- not those kind of black boxes -- behind where the displays would have been. "I write to you to express the Rwanda Government�s profound regret that the exhibit entitled 'Lessons from the Rwanda Genocide,' organized on the occasion of the 13th commemoration of the Rwanda Genocide, has been postponed. Since the "G word" -- genocide -- wasn't applied to the events of 1915, but rather the figure "one million murders," one wag wondered why it couldn't have been negotiated, to bring the number down. A UN spokesperson conceded that this type of bean counting has been known to happen. What will happen in this case remains to be seen. Watch this site. 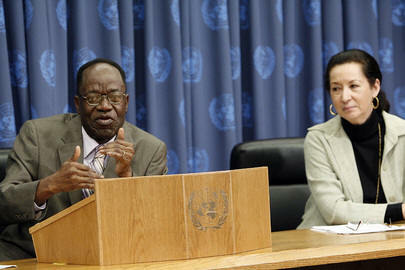 UNITED NATIONS, April 6 -- In a week full of mine talk at the United Nations, some questions were still left unanswered. The UN's head of peacekeeping Jean-Marie Guehenno, asked Tuesday by Inner City Press about the reported use of landmines by the Ugandan military, did not directly respond, but said that a UN Mine Action staffer would get back with information. Video here. This staffer, Justin Brady, provided a list of 64 countries in which the UN is or has been active with mines -- one third of the UN's member states. On Uganda, however, there appears to still be some misunderstanding. UK-based Save the Children, as quoted in the Kampala Monitor of April 2, reports that the Uganda People's Defense Forces have laid landmines in the northeast Karamoja region, where the UPDF has been engaged in violent disarmament of the pastoralist Karimojong. As Inner City Press reported in June 2006, the UN Development Program had been involved in and encouraged the UPDF's collection of guns, which led to deaths of civilians, most recently dozens of children, as reported by Save the Children. But UN Mine Action staffer Justin Brady this week assumed that the problem, if there is one, is providing training to the UPDF to remove landmines. While he said he has now asked colleagues in Uganda about the UPDF's mining, nothing has been heard back in the following three days. Justin Brady told Inner City Press that UPDF personnel had received some de-mining training at a UK-funded center in Nairobi. The first step for the UPDF would be to stop laying mines, to stop killing civilians and stop covering both up. For the UN Development Program, which like the UN Office of Project Services (UNOPS) is a mine action middle-man, the first step would be to be more careful about working with governments which use landmines, and otherwise violate human rights. Also on human rights and governance, Jean-Marie Guehenno on April 3 declined to answer Inner City Press' question about the UN's continued use of peacekeepers from Fiji, following the military coup in late 2006. Video here, article here. 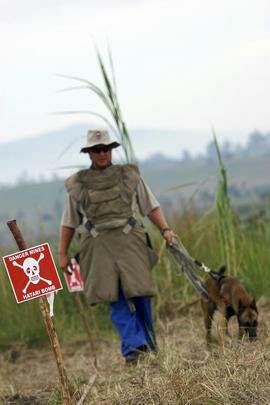 Searching for mines - laid by Ugandan army? While the UN Mine Action Service is a part of the Department of Peacekeeping Operations, UNMAS is active in many countries where DPKO is not (see list below). Inner City Press has covered the mine action logistics work of UNOPS, including in South Sudan, where a UNOPS staffer recounts collecting unexploded remnants of war and piling them in the back of a vehicle. At the check-point outside the UN's compound, guards checked the entire chassis of the vehicle before allowing it to enter, without ever looking at the pile of explosives inside the vehicle. It is a dangerous job, and the front-line workers are to be commended. Among the interested annotations in this list is that UNMAS would take over mine removal in Chad if and when President Deby lets in a UN force. Also, UNICEF's involvement in Chechnya and in Nepal, where with the UN's relatively new force, UNMAS has moved in. The listing of not only UNHCR but also UNDP in Uganda is not only ironic but troubling, in light of UNDP's involvement with the UPDF, and UNDP's reported involvement in the laying of landmines. 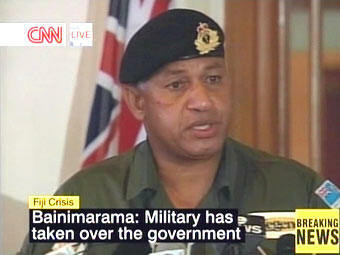 UNITED NATIONS, April 5 -- Following the military coup in Fiji in late 2006, the UN had said it would not use more Fijian troops as peacekeepers until democracy was restored. In recent weeks, New Zealand, Australia and the Commonwealth have said they have asked new Secretary-General Ban Ki-moon to implement this policy. Now it turns out that either the policy has changed, or that the policy wasn't what most people thought it was.